We all worry about the security of our data. However, you can feel secure about the continued investments and top priority that Microsoft has made to protecting all of the information within the Office 365 service. Here are just a few the things they are doing to ensure the safety and security of all of our data, because Office 365 has one of the largest data sets in the world. 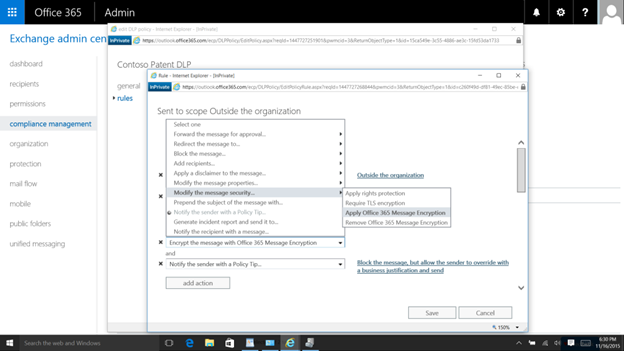 Data Loss Prevention (DLP) in Office 365 allows you to set granular policies that govern your data and define specific actions taken when information is shared. In addition, Office 365 protects your data independently of where it resides, while additionally ensuring device protection. As you are reading your email, the service may be activated to isolate suspicious attachments and block malicious links across your devices to protect you from phishing attacks. All suspicious content goes through a real-time behavioral malware analysis that uses machine learning techniques to evaluate the content for suspicious activity. Office 365 tracks vulnerabilities at scale through machine learning and mitigating them. Again Microsoft’s priority is the security of your data now and into the future. For all your Office 365 needs, please Contact us today. Here is the full article from the Office blogs.